Join us for this once-in-a-lifetime magical experience in Umbria, Italy! Enjoy a full week of mindful meditation, vinyasa yoga and best of all, wine tasting! Abbey Brooks, LouVino's own Michael Henry, and Gina Scarpino have collaborated to create an organically unique retreat that is sure to move your spirit! Each day of the retreat will include multiple yoga practices. Including guided meditation, vinyasa flow (for all levels), and restorative yoga. Skilled teachers Abbey Brooks and Gina Scarpino will collaborate in facilitating an uplifting and trans-formative experience for you as you dive deeply into mind, body and spirit. 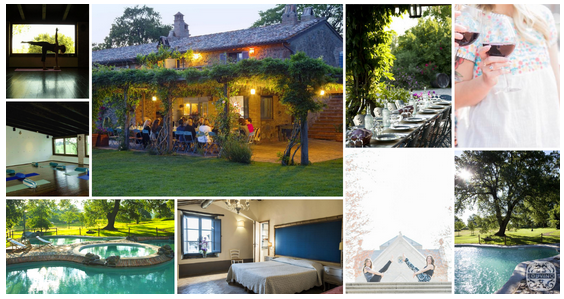 You will stay 7 nights at La Locanda della Quercia Calante in Umbria, Italy. Umbria, often called Italy’s green heart, is known for its medieval hill towns, historic wineries and delicious local cuisine! Family operated La Locanda is dedicated to yoga-focused retreats year round and prides itself on being entirely environmentally friendly. *NEW* early bird special: $250 OFF through February 19, 2019. We will be holding a raffle at the Information session offering $250 off! Combined with the NEW early bird special, one lucky attendee will receive a total of $500 off their price of admission! Deposit $500 - A $500 deposit reserves your spot on this retreat. This deposit is non refundable. Check only. We provide a monthly payment plan as well! *Pricing: Flight to Rome not included but transportation to the retreat center is provided! Click here for Facebook Page with all information!